With Flowers of Shanghai, the Seattle Hou Retrospective takes a big leap forward in time and makes a somewhat less drastic transformation in filmmaking style. When we left off, Hou had moved from his series of coming of age memoirs into an epic trilogy encapsulating much of the history of Taiwan in the 20th Century. I’ll be writing about those history films in a few days, after I see Good Men, Good Women on Friday (I missed the show on Sunday), and then as A City of Sadness and The Puppetmaster play at Scarecrow at the end of the month. Hou followed up that trilogy with 1996’s Goodbye South, Goodbye, a languid film about scheming low-level gangsters trying to make a buck in contemporary Taiwan, it’s the closest Hou has ever come to making a Hong Kong-style triad movie. That one will be playing at Scarecrow Video on April 6th. Less concerned with history or memory than any film Hou had made since 1983 (excepting Daughter of the Nile), it represented a sharp turn into the next great series of films Hou would make, about young people in 21st Century urban centers, films inflected with a very peculiar kind of cinephilia. But before that train really got rolling, Hou would take a brief sidetrack into the 19th Century. Flowers of Shanghai is based on an 1892 novel by Han Bangqing, considered a masterpiece but composed largely in the Wu dialect of Chinese, which is unintelligible to Mandarin speakers. The script (by Chu Tien-wen, of course) is based on a translation by novelist Eileen Chang (she wrote the stories that Ang Lee’s Lust, Caution and Ann Hui’s Love in a Fallen City were based on, among many other works). (After she died in 1995, it was discovered that Chang also translated the novel into English, that translation of The Sing-Song Girls of Shanghai was published in 2005). It sits comfortably within the tradition of films like Kenji Mizoguchi’s Street of Shame and Sisters of the Gion or Mikio Naruse’s Flowing, films about prostitution houses that use the veneer of ritual and respectability to examine the social and economic dynamics of a society as a whole (I’d put Gregory La Cava’s 1937 film Stage Door, about actresses a boarding house trying to make a career on Broadway, in this group as well). Set in four different brothels (flower houses) in the foreign section of Shanghai (this is the late Qing Dynasty period when China, having been slowly being carved apart by European powers is on the brink of collapse), the story primarily follows four women and one man. The man is Tony Leung Chiu-wai, who gave one of his first great performances in A City of Sadness but is by 1998 established as an international arthouse superstar after a series of great films with Hong Kong directors Wong Kar-wai and John Woo. He plays Master Wang, apparently an official of some type from an extremely wealthy family. He is engaged in a longterm client relationship with Crimson (Japanese actress Michiko Hada) but is also spending time with Jasmin (Vicky Wei). Pearl (Carina Lau) is a veteran flower girl, clear-eyed and reasonable, commenting on the foolishness of the young girls in her house, particularly Jade (Shuan Fang), who entertains romantic notions of marriage in regard to her young client. Emerald (Michelle Reis) is shrewd and cynical, seeking to buy herself out of the control of her “auntie”, played by Rebecca Pan. This multi-national cast is easily the most star-studded of any of Hou’s films, that he would put them to use in a film consisting almost entirely of middle-distance master shots, with an opium-drenched pace where the vast majority of the action and emotion occurs in the spaces between scenes is surely a stroke of perverse genius. But those master shots! When we left off Hou in the late 1980s, he was perfecting the minimalist style that was the hallmark of the Taiwanese New Cinema: long shots with minimal camera movement and very little editing. But while that cinema eventually evolved into the form now practiced (expertly, beautifully) by Tsai Ming-liang, Hou in the mid-90s went in a different direction (as did, eventually, the Korean director Hong Sangsoo who began as a no-movement minimalist and gradually adopted a few rule-breaking idiosyncrasies, most obviously a clunkily emphatic quick zoom). Beginning with Good Men, Good Women, Hou’s camera begins to move freely around the film frame, floating up and down, side to side, tilting and panning to explore space, but only very occasionally moving forward into that space. The image in Flowers of Shanghai is almost always in motion, but the movements are so slow, so dreamlike, like floating on a cloud, or a haze of opium. Each shot begins with a fade in and ends with a fade to black, like eyes that can barely keep themselves open. Not every scene plays out in a single shot, though most of them do, and there is one instance of forward movement and one POV shot, both in the same scene, the one that marks the emotional peak of the film and its only real instance of action. These dreamlike images are densely packed with an almost parodic assortment of finery: silks and jade and jewels, gorgeous costumes and makeup and furniture and pipes and cups and bowls. Never has congee with ham seemed so elegant, so refined. Every frame is dominated by lamplight and by the lamps themselves, which serve to obscure and isolate characters in the carefully choreographed staging (the camera only seems to drift aimlessly) while imbuing the film with a lush golden glow, as much a character in the film as the famed magic hour of Terrence Malick’s Days of Heaven (and how magical it is to finally see this on 35mm film!) We never once catch a glimpse outside the flower houses, our universe is confined to these few intricately-adorned rooms. This is what lies at the heart of the film: the different ways these characters interact with these rooms. Emerald thinks she can buy her way out of it. Jade wants to marry her way out. Pearl doesn’t mind it so much, she’s smart, she’ll get by no matter what comes. Wang and Crimson though. At one point, there’s a commotion during one of the big dinner parties and all the men and women rush to the windows to see what’s happening (a raid? a fire? a suicide? a revolution?) But Wang, he does not move. He has no interest in the world outside the flower house and so we are stuck at the table with him while exciting things are afoot in the distance, in the depths of the frame. Near the end, we learn Wang, separated now from both Crimson and Jasmin, has been promoted and is to move back to Guangdong. Wang looks even more depressed than normal. 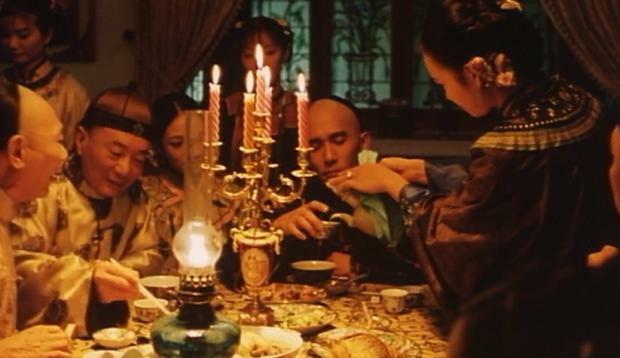 And in the final shot of the film we see a man (who looks a bit like Wang, and I thought it actually was him until I was, thankfully, corrected) and Crimson together in her room, he eats some food while she fills up another pipe, as she and Wang had done so many times before. These rooms make Wang and Crimson miserable, but they never ever want to leave. Flowers of Shanghai plays again on Thursday, March 26th at the Grand Illusion.